Buddy collection has been enriched with new elements that enhance its versatile, functional nature, featured by a contrast between the bold volumes of the seat and a slender, lightweight frame. 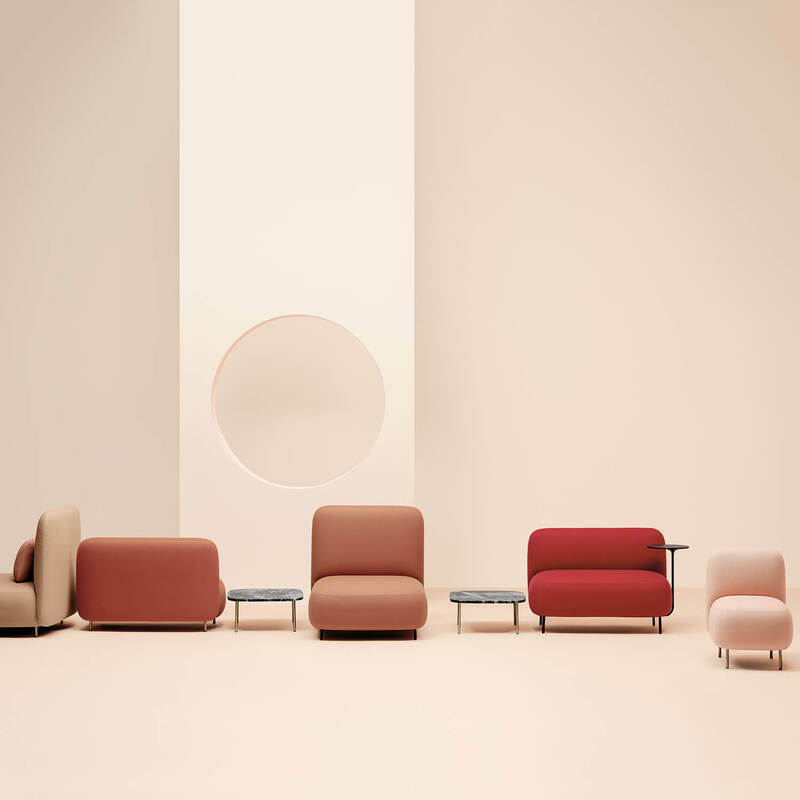 The line comprises a chair, a two seats bench and a chaise-longue with generous backrests, combined with softly upholstered poufs, creating a family of soft modular seatings, that reflect the friendly spirit of the collection. The different sizes of the poufs and backrests, each available in two heights, allow multiple combinations matching the varied needs of contemporary and multipurpose spaces: from relaxation areas to airport lounges, and through to latest-generation co-working spaces. A turning tablet can also be added to the configuration. Babila stool with backrest adds a new element to the series, fitting harmoniously into a collection that evokes classic forms, while staying true to its nature, seemingly treading the line between tradition and innovation. 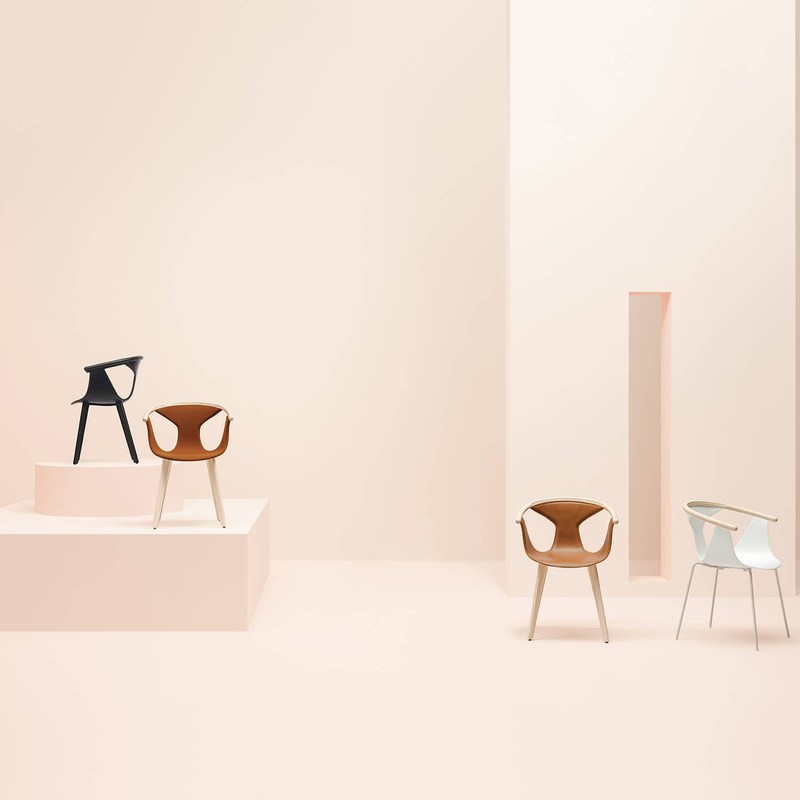 The soft, harmonious silhouette of the curved shell features a chamfered element that defines its profile, giving it an ergonomic shape, while the backrest comes with a distinctive cut-out design. The stool is available both in injection-moulded polypropylene and in a upholstered version. Babila stool comes with tapered legs in ash, joined together by a die-cast aluminium ring that acts as a footrest, or with a steel rod sled frame. 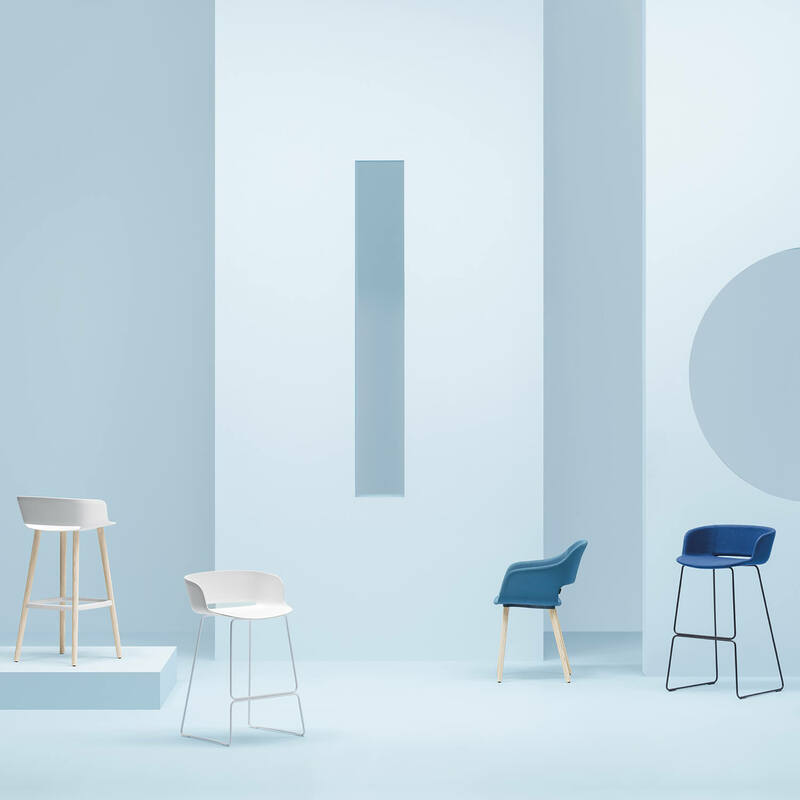 Available in two heights, this stool offers a midway solution between the armchair and backless stool, while it encompasses key elements of both. Dome stool is the latest evolution of the chair and features a structure which is an alternation of linear and curved signs. 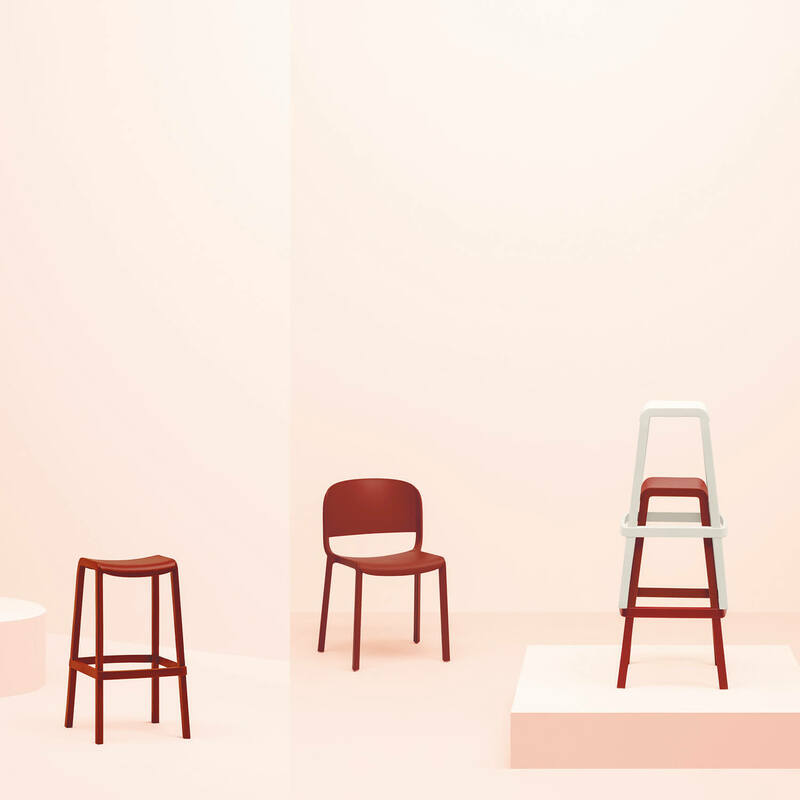 A plastic stool that recalls the typical wood joinery and the shapes of metal, where the minimalist essence and the structural simplicity are maintained. The innovative rectangular shape of the seat with rounded edges makes for an ergonomic stool, despite its small saddle seat. Made entirely from gas air-injection moulded polypropylene, Dome stool is designed for all decors and varied uses, and can also be stacked vertically. Remind, or call back to mind – a concept rendered in Latin by the word ‘re-cordis’, meaning ‘to pass through the heart’. Mind and heart have been both essential to create Remind: the heart in its creation and the mind in its production. 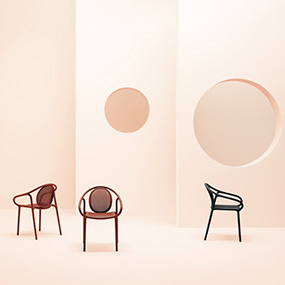 While evoking the soft sinuous curves of wooden chairs from the late nineteenth century, Remind’s organic silhouette recalls “something never seen before”, a universal shape able to fit into any space and style of decor. The result is an innovative polypropylene armchair, in which each element is conceived to ensure total comfort and cosiness. The breathable texture makes it airy and even lighter. Made from injection-moulded polypropylene, the armchair is functional and versatile, perfect for both outdoor and indoor spaces. Fox is an elegant collection of armchairs having a distinctive sign and contained dimensions. An identifying design featured by an harmonious mix of materials and contrasts among geometric lines. A thin fiber-glass reinforced polypropylene shell is set in the ash wood profile curved and rounded at the ends, as an hug. Versatility and functionality of the collection is guaranteed thanks to the multiple colour combinations between wood, polypropylene and the steel tube legs which allow the stacking. With its elegant silhouette and minimal design, Elliot table has a strong identity that combines soft lines with sinuous natural forms. 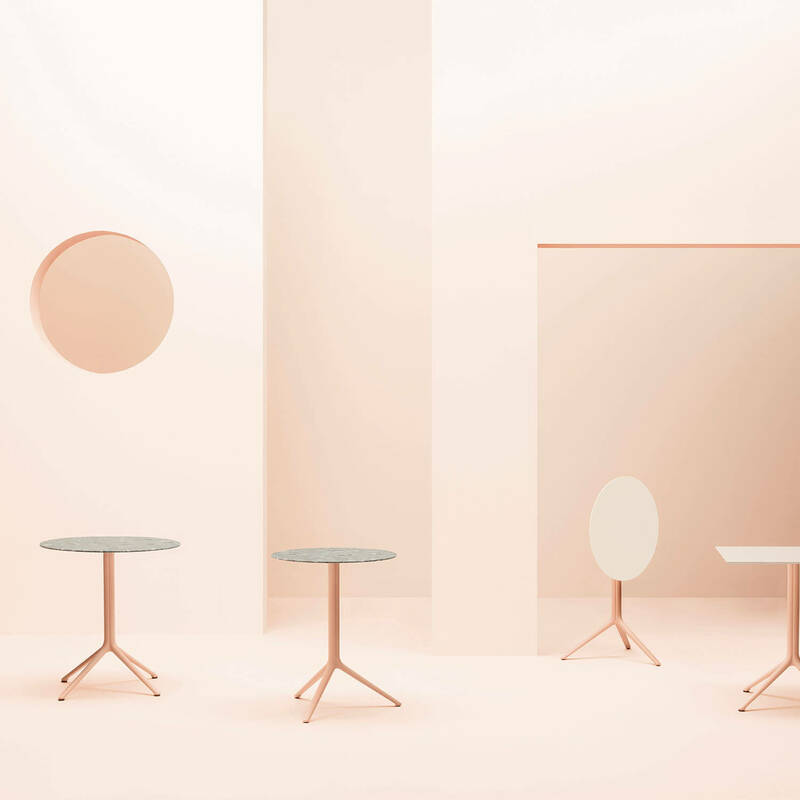 The shape of the column, which transforms into an airy base, expresses continuity and attention to detail, while the table’s sophisticated architectural design conveys a striking sense of harmony and solidity, making it light and functional. The three-lobed column in extruded aluminium narrows down and splits open to form three feet in die-cast aluminium, which elegantly sit on the floor. Designed for indoor and outdoor use, and available in three different heights, the Elliott table is also offered with a folding top so that it can be stored away with very little space.